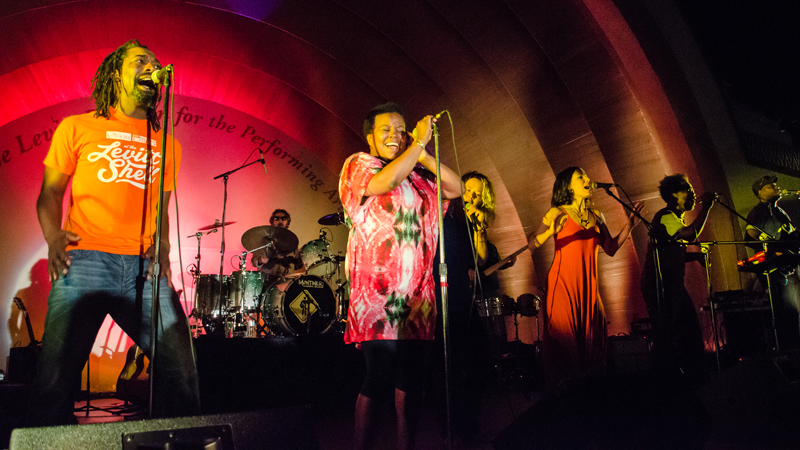 Playing for Change performing at Levitt Pavilion Pasadena as part of the 2014 Levitt National Tour. Embracing all Levitt artists and Levitteers—no matter their country of origin—is a big part of our mission to strengthen the social fabric of America, which has been immeasurably shaped by immigrants. Take a look at a few of the many artists from around the world who have graced Levitt venues! The mantra of this global music movement best sums up its mission—“connecting the world through music.” Started as a project to find inspiration and “the heartbeat of the people” in America, Playing for Change has grown into a worldwide network of musicians, with the likes of Sara Bareilles, Bono and over 100 other artists who have contributed vocals and instrumentals to the project’s “Songs Around the World” videos. These music videos feature musicians separated by thousands of miles performing a single song from all corners of the globe, from NYC’s Washington Square to the Himalayan Mountains. In 2014, Playing for Change brought together a live band—with members representing nine countries—for an American tour (which included the inaugural Levitt National Tour), proving to audiences that no matter where we come from, music can always bring us together. Multi-instrumentalist Samite knows the healing power of music first hand. Born in Uganda, Samite fled to Kenya during the Ugandan Civil War, which temporarily halted his career in music, particularly playing the flute for audiences in his home country. He subsequently immigrated to Ithaca, New York, a town that has welcomed refugees for decades. Samite has since re-established his career, releasing over 10 albums to date and bringing his smooth vocals and his kalimba, marimba, litungu and flute instrumentals to venues around the world. The Ugandan artist’s extensive travels aren’t just for playing traditional venues—Samite brings music therapy to seniors in central New York and children in Africa through the nonprofit he started, Musicians for World Harmony. “While performing, I see that people are able to forget their differences and join as one in the moment,” Samite stated in his artist biography. Bhangra, a genre of club music that fuses popular genres like rock with the traditional folk music of India’s Punjab region, has appeared on hits by hip-hop’s biggest names like Missy Elliott and Jay-Z. But prior to Bhangra’s mainstream entrance was DJ Rekha, who caught New York City by storm playing Bhangra in local clubs. Born in London to Pakistani immigrants, DJ Rekha was exposed to Bhangra as a teen by her mother. She began spinning records as a Queens College student, combining her love of hip-hop and Bhangra into a danceable fusion of eclectic beats and instrumentals. Beyond the Big Apple, DJ Rekha’s music has captured audiences far and wide as she plays clubs across the world. Her impact on popularizing Bhangra—in addition to breaking ground as a female DJ in a male-dominated club industry—has even earned her the titles of “Bhangra’s Ambassador” by The New York Times and “pioneer of underground Bhangra” by Huffington Post. Ori Naftaly’s first contact with Memphis was in 2013, when he and his eponymous band traveled thousands of miles to represent his home country of Israel at the International Blues Challenge. The Ori Naftaly Band would become the first Israeli act in the competition’s history of almost two decades to advance into the semifinals. It was an experience that left a deep impression on Naftaly. “When I came back to Israel after the first time I competed, every bone in my body said that I need to go back and stay,” the guitarist told the Commercial Appeal last week. Naftaly permanently relocated to Memphis that same year and with a desire to collaborate with other artists, eventually formed the band Southern Avenue with local singer Tierinii Jackson. Infusing funk and soul into their blues sound, the band was a hit at Memphis clubs, even described by John Burk of the famed Concord Music Group, as a young group that “embodies the spirit and sound of Memphis, both past and present.” Having established themselves in the River City, Southern Avenue is slated to release their debut record this year under Concord’s Stax record label. Brazilian artist Katia Moraes has been captivating fans with her joy and energy for the past 20 plus years. Now based in Los Angeles, the singer-songwriter brings the sounds of her homeland to audiences spanning across the U.S. and the world, from the Hollywood Bowl to the Sydney Festival in Australia. She has also collaborated with some of Brazil’s most famous artists, like jazz-fusion pioneer Sergio Mendes, Miles Davis collaborator Airto Moreira and Brazilian rock icon Rita Lee. While her samba, salsa and jazz originals gets people up and dancing, Moraes certainly has some moves of her own, which you can watch in our Meet the Artist video. Her sound and energy are as much influenced by Brazilian artists as they are by the American artists she grew up listening to, like Janis Joplin and Stevie Wonder. “I feel inspired by artists who make me feel equal, who remind me that we are all here in the same boat,” the singer-songwriter told Enjoy Magazine in 2015. What a perfect act to play Levitt concerts, where people from all walks of life can enjoy music on the Levitt lawns together! While claiming different nationalities and homelands, these talented artists have all touched the hearts of Levitteers across the country through their music. We’re incredibly grateful that these artists and more have been able to share their craft with American audiences! Has an artist from outside the country wowed you recently? Tell us in the comments below! This entry was posted in Levitt Artists and tagged DJ Rekha, Katia Moraes, Ori Naftaly Band, Playing For Change, Samite on February 1, 2017 by Lucy Truong.